Children are recognised in UK law as being vulnerable, and there are many different laws that are designed to protect their welfare – from laws concerning discipline to what happens if their parents’ relationship breaks down. Apart from their obvious basic human rights and a right to an education, the law says that all children need to be supported through parental separation, bereavement and protected from abuse. Parents also have rights to the custody and access to their children – as well as legal responsibilities for them. Who Has Legal Responsibility For Children? This depends on the relationship between the parents. If a child is born to married parents, they automatically both have legal responsibility. The same applies if a married couple adopt a child. If parents aren’t married, though, parental responsibility isn’t automatically awarded to the father. The current law gives a child’s mother automatic parental responsibility for that child. The father can become legally responsible if he then marries the mother; if the child was born after 1 December 2003 he can also register the birth jointly with the mother and acquire legal parental responsibility. If neither of these applies, the only way a father can become legally responsible is by applying to a court – with or without the agreement of the child’s mother. It’s also important to know that if a child’s parents aren’t married, and even if they have lived together for many years, if the mother should die, parental responsibility does not always pass to the natural father. 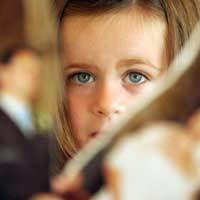 The court then either accepts or reject the application – and the decision must always be based on what it thinks will be in the child's best interests. Even if you don’t have full parental responsibility for a child, you still have a legal responsibility to provide financial support. In many cases, when parents separate or divorce, the arrangements for the children can be decided amicably and there is no need for any court involvement. If this is the case, when you file for divorce you will need to fill in a 'Statement of arrangements for the children' which you can get from any divorce county court, or online. If you can’t come to an agreement on what’s best for the children, it may have to be decided by a judge, or you could be sent to official court-approved mediators. Your divorce won’t be final until the arrangements for the children have been approved, so if you can decide what’s going to happen beforehand, it’s always better for all concerned. If your discussions seem to have come to a stalemate, you can contact mediation services through the Family Mediation Helpline on 0845 60 26 627. Before 1998, parents in the UK had the legal right to use what was called “reasonable chastisement” to discipline their children - but there were always issues around what constituted “reasonable.” In 1998, the European Court of Human Rights decided that this law didn’t do enough to protect children’s, so the laws was tightened up with the introduction of the Children’s Act of 2004. Smacking is still legal as long as it does not cause any visible bruises, grazes, scratches, swelling or cuts. Some ministers have called for a complete ban on smacking children, and in Northern Ireland there is an outright ban already in place.